(Photo credit: Alma Montiel) Oscar De La Hoya doesn’t like the idea of Floyd Mayweather Jr. facing Golden Boy Promotions’ fighter WBA/WBC junior middleweight champion Saul “Canelo” Alvarez at a catch-weight of 152 pounds instead of at the full weight for the junior middleweight division at 154. De La Hoya thinks Mayweather has some worry about the fight because otherwise he’d have agreed to fight the 22-year-old Canelo at the full weight. I’m not sure that De La Hoya is seeing things from Mayweather’s perspective in this fight. 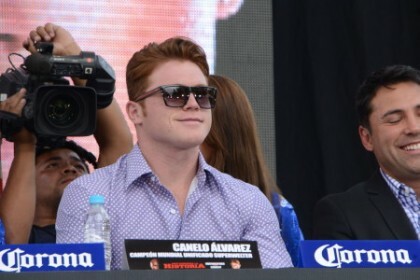 It seems like De La Hoya is seeing it through the eyes of a promoter trying to look out for his young fighter Canelo that he’s trying to turn into a pay per view star so that he can start bringing in the big cash for Golden Boy. If you look at it from Mayweather’s perspective, he’s been fighting at around 150 lbs. after he rehydrates for his fights at welterweight. He has the WBA junior middleweight title after being Miguel Cotto last year, but Mayweather isn’t a junior middleweight physically. He’s a guy that moved up in weight and beat up a vulnerable fighter in Cotto, who has seen better days. Canelo weighed 172 lbs. for his last fight against Austin Trout, and that’s over 20 pounds more than Mayweather weighed for his last fight. Canelo is barely making weight for his fights at 154, and he actually weighed more for his last fight against Trout than WBA middleweight champion Gennady Golovkin did for his fight with Matthew Macklin last Saturday night, and Golovkin is a middleweight. So what we’re really talking about here is a fighter that is really more of a middleweight in Canelo facing a true welterweight in Mayweather. As De La Hoya said, “we have weight classes for that that reason,” but what we’re seeing more and more in boxing is fighters like Canelo and Julio Cesar Chavez Jr. fighting in weight classes much lighter than their actual weights when they come into their fights, and this gives them a tremendous advantage over their lighter opponents. Thus far, the sanctioning bodies aren’t doing anything to stop this practice by installing strict rehydration limits to keep guys from rehydrating 15-25 pounds overnight and outweighing their opponents by a huge amount. So you can’t blame Mayweather for asking for Canelo to come in two pounds lighter than the limit when you see him rehydrating to 172 lbs. for his fights. Mayweather isn’t going to rehydrate into the 170s, so why should he fight someone that heavy? Canelo out-weighed the WBA middleweight champion of the world in Gennady Golovkin for his last fight. A better question is why is Canelo fighting at 154 against 147 lb. welterweights instead of in the middleweight division against guys his own size? Previous boxing news: Can Sergio Martinez handle Golovkin’s power?